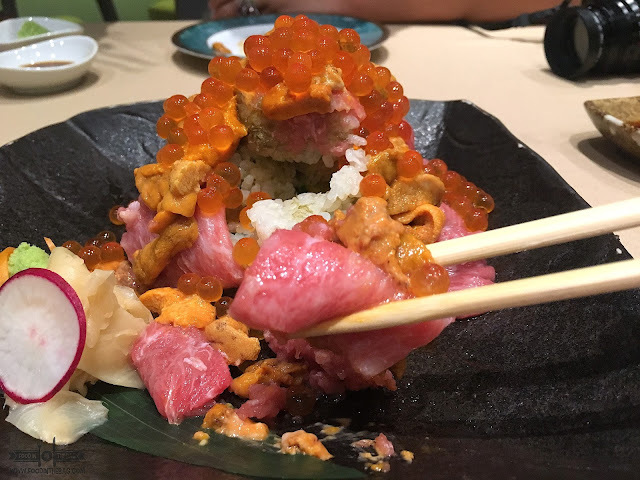 KAZUNORI JAPANESE RESTAURANT IN MAKATI : Indulge and be rewarded. 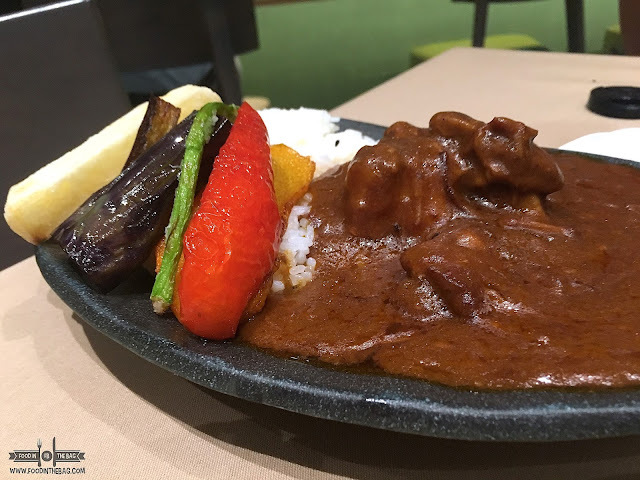 If there is one thing to consider when going to Japanese Restaurants it would always be the location, price point, and of course the quality and taste of the dishes that they serve. 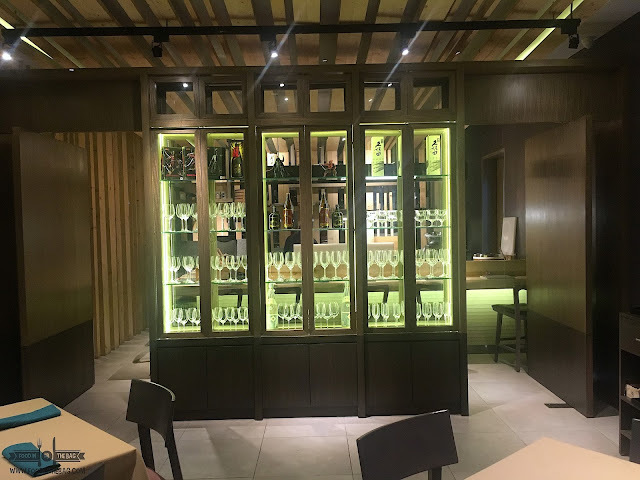 Lately, there has been a buzz about a Japanese establishment located along Chino Roces Avenue. It's situated within a car dealership that seems quite odd and unique but not the first time for a restaurant. 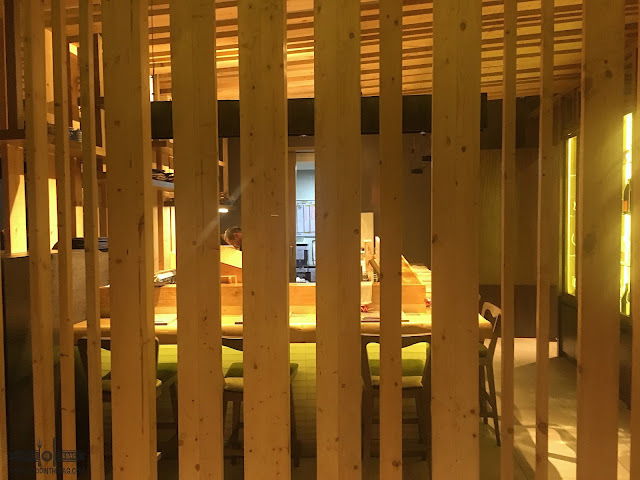 Owned by the same group behind Yushoken and Mendokoro Ramenba, Kazunori is no different from other high end Japanese restaurants in the city. While it's quite out of the way for northerners like myself, it's sometimes okay to trek out and try something new. As you enter, the place is divided into three. There's the cafe area, the sushi bar, and the main dining. I would suggest making a reservation just in case the place is full. Looking through the menu, we found out that the prices of the cooked dishes that they serve were actually somewhat similar to other restaurants. What was quite surprising would be the tags on the different cuts of sushi and sashimi. It seemed expensive for a few slices of seafood. Apparently, these are imported from Japan, hence the cost. 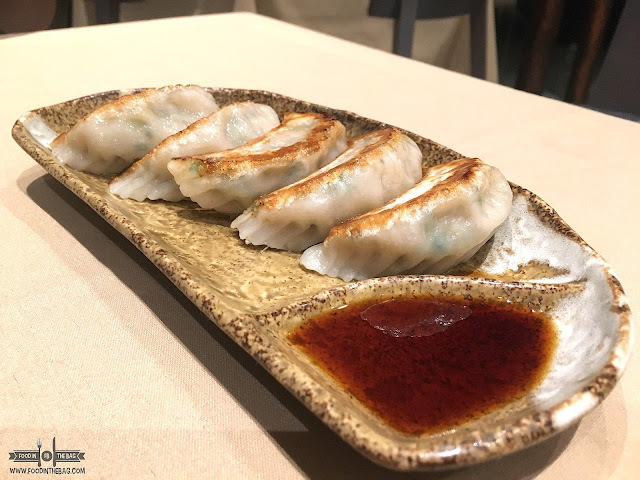 Starting off with some GYOZA (Php 180), these dumplings were actually not bad. It wasn't spectacular but it was good enough. The skin was a little bit thick on some instances but were too thin on some parts. Still, it gave that chewy texture you would look for. The noodles is where KAZUNORI stands out. 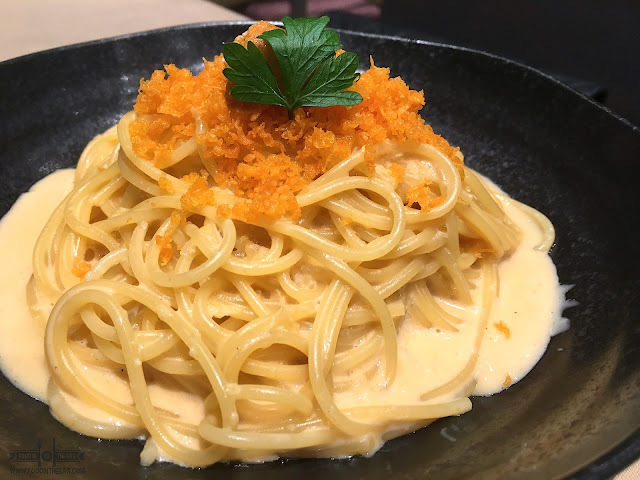 You could go for the UNI PASTA (450Php) if you're not sure what to get. It's buttery and creamy though some might find it lacking in UNI flavor. It does give off that rich feeling each time you take a slurp. You might need something else to cut the flavor though as it becomes monotonous after a few bites. On the other hand, I had nothing but praises to say about the KARAI ZARU SOBA (460Php). 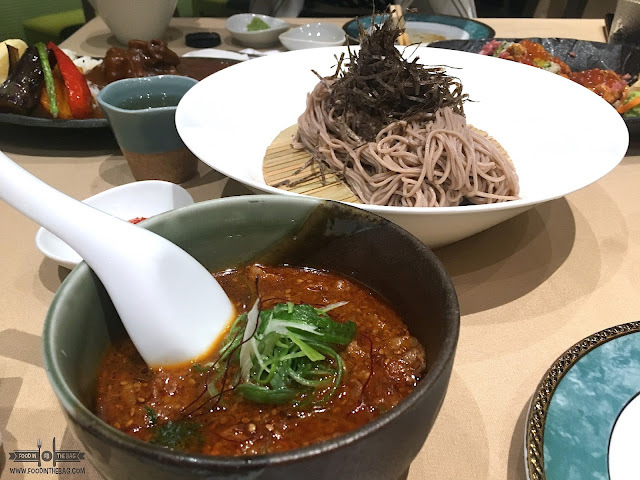 Cold buckwheat noodles is served with a dipping sauce. In this instance, the dipping sauce is somewhat spicy on its own. Even if we requested it to be at the lowest level, there's still a hint present. To counteract this, broth is given just to dilute it. The amount of noodles were pretty generous as well. Best to eat this as soon as it is served as the noodle quality might degrade if it is left untouched for some time. Believe it or not, we actually ordered more than we could chew. Hence, the PORK CURRY (390Php) was generally left to the side. Although we did try it, I wouldn't say that I'll be back for it. It seems quite normal and I guess it lacked the special factor it needs for some to order it again. The curry is pretty thick and the pork did absorb the flavors pretty well. Here's a little anecdote about the next dish that kept me laughing for days. My friend saw it on Instagram and was pretty much sold that she needed to try it out before her trip. She asked me to go with her and I did because I read up on the restaurant and it had great feedback. That night, we came in late because of the horrendous rain. She was so eager to order this that the first thing she did after sitting down was to ask if it was still available. It was and so she did without asking about the price. A few minutes later, our server came in to take the rest of the orders. When my friend clarified if her first order was taken, she asked about the price. It was a staggering 5,000Php or about 100USD. We were both shocked but let's just say we charged it to experience and still went ahead. Named after the chef, the SAITO SPECIAL (5,000Php) is a mixture of everything good about Japanese food. It's an off menu item that could be requested. 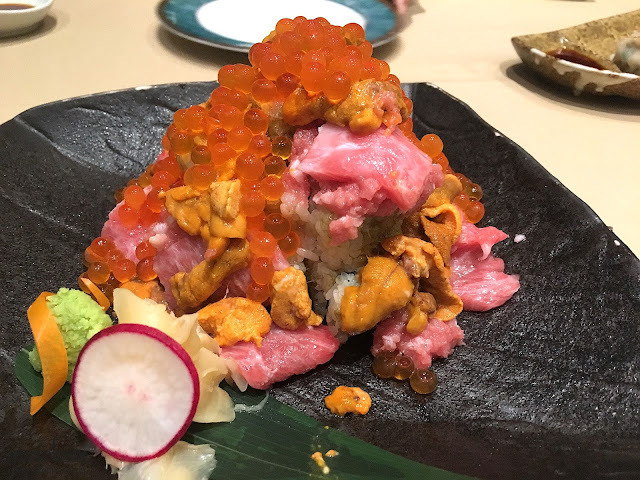 It is a mixture of UNI, OTORO, IKURA, and CHUTORO. It's like a mountain of different fresh ingredients just to make you foodgasm. Underneath, there are cut up rolls just so that you could use them to as a vessel to carry all the toppings you may want. Granted that it's a bit pricey, it is worth a try. It's not everyday that you get to indulge. Would I order it again? I might if I was part of a bigger group. If there were 4 or 5 of us, I think it would be good enough to share. KAZUNORI is one of those restaurants that has it all. It's no wonder that people flock in to get a taste of what it has to offer. PROTIP: Don't follow Waze, it will bring you to a village at the back. It's along the main road. Coming from EDSA, it's on your left. Parking is pretty much available in front and at the back since it is in a car dealership.